Light and fluffy delights! 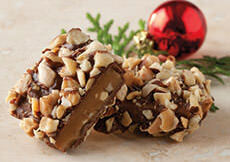 Our classic Divinity combines sweet vanilla and crunchy walnuts. 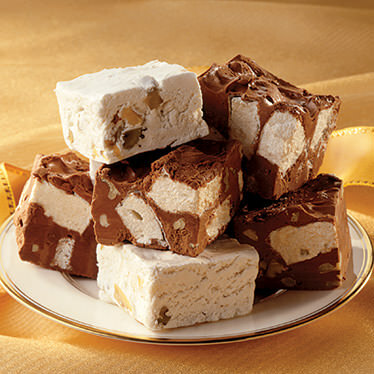 And our Rocky Road is a creamy mix of whipped chocolate, marshmallows, and walnuts. You can buy a 1-lb. box of Divinity or a 1-lb. box of Rocky Road separately or you can purchase the 1.5-lb. Combo featuring half Divinity and half Rocky Road. INGREDIENTS: Rocky Road: milk chocolate (sugar, cocoa butter, whole milk powder, chocolate liquor, soy lecithin [an emulsifier], natural vanilla flavor, vanillin [an artificial flavor], water, granulated sugar, walnuts, palm kernel flakes, liquid sugar, corn syrup, coconut oil, gelatin powder, vanilla, salt. ALLERGEN INFORMATION: Contains milk. This product manufactured on equipment used for processing peanuts, tree nuts, wheat, and seeds. INGREDIENTS: Divinity: sugar, corn syrup, water walnuts, palm kernel flakes, dried egg whites, vanilla, salt. ALLERGEN INFORMATION: This product manufactured on equipment used for processing peanuts, tree nuts, wheat, and seeds. I had never tried Divinity before. It tastes like eating a cloud. It's fluffy, but not sticky like marshmallow. It's a bit too bland for my taste. But if you like mild flavors it should be fine. The Rocky Road was much harder than I expected. It's as hard as a chocolate bar. Not like the Divinity. 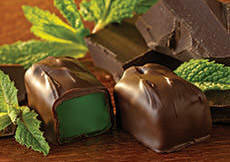 It's like whipped hard chocolate with marshmallow chunks. I really liked this and would recommend it for anyone who likes chocolate. I like Aplets and Cotlets but will not buy them because they are packegad with so much waste! If you are interested in cutting down on waste, why purchase these? Inside the box is a large plastic tray with A LOT OF WASTED SPACE. These are very dense confections and could be easily packed close together in candy papers to keep them from sticking vs. the wasteful plastic tray. They could be packegad in 1/4 of the box they now use up. If they ever change their packaging, I will buy them but until then, I will not. DELICIOUS! Far better than any other company's. Soft, made like my mama used to make 50 yrs. ago!